Anyone who’s seen him suit up as host of The Soup on E! 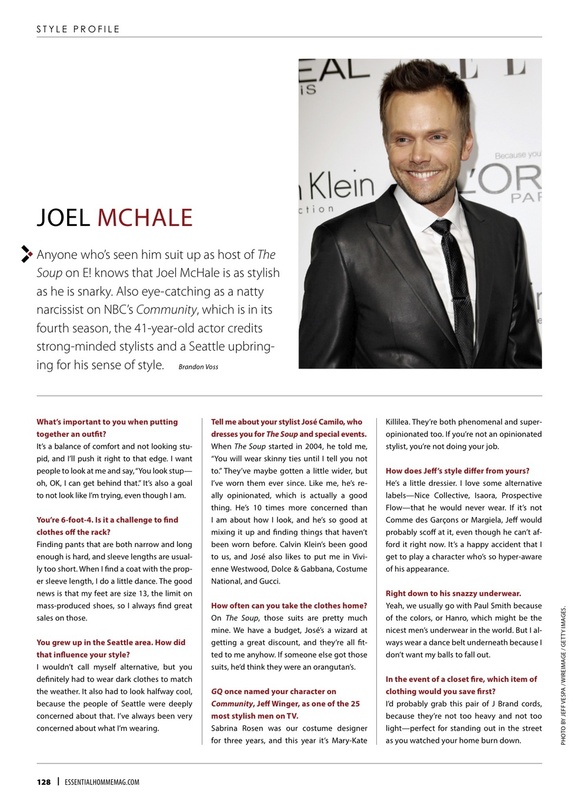 knows that Joel McHale is as stylish as he is snarky. Also eye-catching as a natty narcissist on NBC’s Community, which is in its fourth season, the 41-year-old actor credits strong-minded stylists and a Seattle upbringing for his sense of style. Essential Homme: What’s important to you when putting together an outfit? Joel McHale: It’s a balance of comfort and not looking stupid, and I’ll push it right to that edge. I want people to look at me and say, “You look stup — oh, OK, I can get behind that.” It’s also a goal to not look like I’m trying, even though I am. You’re 6-foot-4. Is it a challenge to find clothes off the rack? Finding pants that are both narrow and long enough is hard, and sleeve lengths are usually too short. When I find a coat with the proper sleeve length, I do a little dance. The good news is that my feet are size 13, the limit on mass-produced shoes, so I always find great sales on those. You grew up in the Seattle area. How did that influence your style? I wouldn’t call myself alternative, but you definitely had to wear dark clothes to match the weather. It also had to look halfway cool, because the people of Seattle were deeply concerned about that. I’ve always been very concerned about what I’m wearing. Tell me about your stylist José Camilo, who dresses you for The Soup and special events. When The Soup started in 2004, he told me, “You will wear skinny ties until I tell you not to.” They’ve maybe gotten a little wider, but I’ve worn them ever since. Like me, he’s really opinionated, which is actually a good thing. He’s 10 times more concerned than I am about how I look, and he’s so good at mixing it up and finding things that haven’t been worn before. Calvin Klein’s been good to us, and José also likes to put me in Vivienne Westwood, Dolce & Gabbana, Costume National, and Gucci. How often can you take the clothes home? On The Soup, those suits are pretty much mine. We have a budget, José’s a wizard at getting a great discount, and they’re all fitted to me anyhow. If someone else got those suits, he’d think they were an orangutan’s. GQ once named your character on Community, Jeff Winger, as one of the 25 most stylish men on TV. Sabrina Rosen was our costume designer for three years, and this year it’s Mary-Kate Killilea; they’re both phenomenal and super-opinionated too. If you’re not an opinionated stylist, you’re not doing your job. How does Jeff’s style differ from yours? He’s a little dressier. I love some alternative labels — Nice Collective, Isaora, Prospective Flow — that he would never wear. If it’s not Comme des Garçons or Margiela, Jeff would probably scoff at it, even though he can’t afford it right now. It’s a happy accident that I get to play a character who’s so hyper-aware of his appearance. Right down to his snazzy underwear. Yeah, we usually go with Paul Smith because of the colors, or Hanro, which might be the nicest men’s underwear in the world. But I always wear a dance belt underneath because I don’t want my balls to fall out. In the event of a closet fire, which item of clothing would you save first? I’d probably grab this pair of J Brand cords, because they’re not too heavy and not too light — perfect for standing out in the street as you watched your home burn down. Essential Homme, March/April 2013 issue.